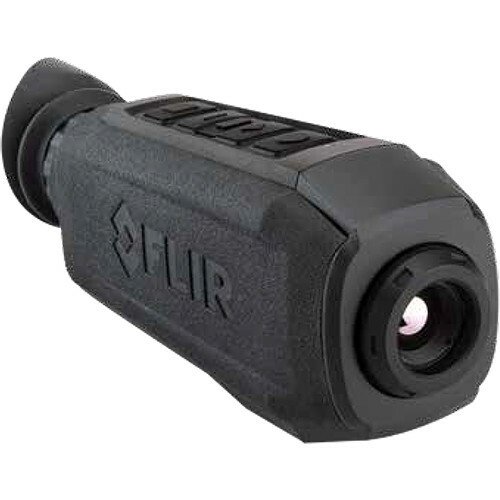 The FLIR Scion PTM166 Thermal Monocular gives law enforcement and public safety professionals the ability to stream encrypted live video, letting command centers monitor any pursuit, evidence recovery, or search and rescue effort. The device also records geotagged video (2GB onboard capacity, and up to 128GB with an optional micro-SD memory card), and its 60 Hz refresh rate and picture-in-picture zoom give a clear view of the subject despite darkness, glaring light, or lingering haze. At the core of this device is the BOSON 12µm VOx microbolometer with 640x512 resolution. The optical system includes a 13.8mm lens with a 31x24° field of view and 1x, 2x, 4x, and 8x digital zoom. Thermal palettes include White Hot, Black Hot, Iron Bow, Rainbow, Graded Fire, and Lava, and display modes include scouting, picture-in-picture, and navigation. Communication capabilities include NFC (near field communication), Bluetooth, WiFi, and FLIR's TruWITNESS real-time streaming platform. The Scion PTM166 is IP67-rated weatherproof and is powered by six CR123A batteries, with a runtime of 4.5 hours at 68°F. It measures 9x3.0x2.4" and weighs 20.2 ounces.